KAKAAKO — The Sacred Hearts girls volleyball team made sure its season didn't end the same way it started. 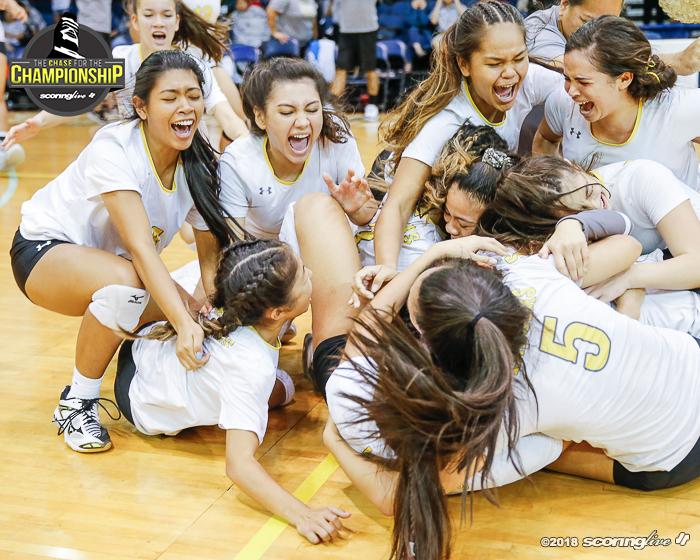 The Lancers took down two-time defending Division II state champion Le Jardin with a 19-25, 26-24, 25-13 and 25-17 win in the title match of the New City Nissan D2 State Championships Saturday night at the Neal S. Blaisdell Arena. Sacred Hearts started the season 0-3, which included a season-opening loss to the Bulldogs, but rattled 13 wins in 14 matches to capture its second state title in school history — its first since 2006. "This feels amazing. Our girls worked so hard. We put time on the court and it's a surreal feeling," said senior setter Makenzie Faamausili-Cacoulidis, who dished out 43 assists to five different hitters. It was a balanced effort across the board for the Lancers (13-4), who won four straight matches to win the championship. Ryanne "Cookie" Burnett had 15 kills, Kayla Murray 12, Ramsaye Wakinekona 11 and middles Shawna Thompson and Shaydee Afoa each had six kills apiece. The Lancers also had a strong effort defensively with 87 total digs, with 24 coming from libero Alissa Bautista. Burnett and Faamausili-Cacoulidis each had 13 digs, Hiilei Puchalski 12 and Agnes Brown had 10 more to round out the leaders in the back row. "The girls played lights out," said second-year Sacred Hearts coach Raymond Patcho. "In the beginning of the season, we had to learn the system and stay positive and trust the system. When they did, ‘woah,' lights-out playing by everybody. The thing was spread out across the net, everybody had their kills, everyone had their digs. We played as one team." Le Jardin coach Lee Lamb also commented on the Sacred Hearts' growth since the start of the season. "It's like night and day," he said. "They outplayed us (tonight)." Outside of 7-0 Le Jardin run to close out the opening period, it was a commanding performance by the Sacred Hearts, who finished in fourth place in the ILH D2 first round. The Bulldogs (14-3) nearly came back to win set two, but the Lancers were able to hold them off to tie the match heading into the third set. A pep talk by Patcho and his coaching staff in the final points of set two gave the Lancers the much-needed momentum to dominate the final two sets. "We just pulled them together and said, ‘hey, we're the best team, we're the best team here so play like we're the best team. Stay in system, stay discipline,'" said Patcho. Burnett, a 5-foot-8 senior, heard her coaches loud and clear after that point in time. She put down 11 of her match-high 15 kills in the last two sets of play to help the Lancers cruise to victory. "When he said that, that really changed me and my mindset, everything. It's our last game as seniors, just have to push hard until the end," said Burnett. Nive Tuileta had 14 kills, 19 assists and 10 digs to lead Le Jardin in the loss.